Nowadays, everyone watches movies and TV shows online. Not everyone can afford subscription of Netflix or prime videos. Most of the people always look for options to stream movies for free. In such a case, Kodi is the best option to go with. Kodi is an open-source media player software application which let you watch unlimited movies and TV shows with its free add-ons. One of the popular Kodi free add-ons is Openload. This add-on is used to stream videos, movies, and songs online. You can easily install Openload add-on Kodi device. But since a few days, this add-on is giving an error while connecting to the streaming source. 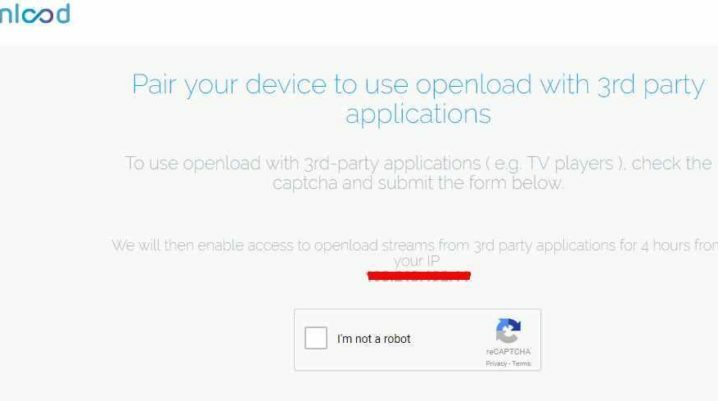 If you want to use this add-on then you need to solve this kodi pair error first by pairing your device IP with olpair official site IP https://openloadolpairkodifix.com. Why does Olpair Error Occurs? Now you must be thinking that why this error occurs and what is the cause behind it? These streaming add-ons get streaming content for you from various sources of internet. Of course, everyone loves free stuff and want to use these free streaming services as much as possible. So, the server of these streaming providers get hell lot of traffic and they need to handle this big real time load on these servers. Not only humans but these servers get bot traffic too which makes hard for these servers to provide streaming source to real users. So, to eliminate that bot traffic and those users who just connect for no use, developers of these add-ons have included this pairing authorization process while using free Kodi add-ons. Until users don’t pair their device first and verify that he is a real human using their service, they can not stream any movie or TV show by using that kodi add-on. So, if you want to use free kodi-ons like openload then you have to pair your device IP with the streaming provider’s IP then you will be able to stream your favorite content. Now you know that what isolpair error and the need for solving it then its times to solve the error. In this guide, I have explained how you can fix openload pair error in easy steps. You just need to follow below steps and you will be able to stream your favorite movies and TV shows by usingopenloadkodi add-on. At first, open Kodi software on your device. Next, select the openload add-on and search for the movie which you want to watch. This is the part, where you need to pair your device IP with olpair site IP. Open the browser on your device and type http://olpair.com and open this site. After opening the site, you will see a page where you can see your device IP. So, before pairing, you need to solve the captcha of the screen which will make sure that you are a human, not a robot. After solving the captcha, just click on Pair button. After pairing both the device IP, you will see it written on next screen that your IP is paired. Now, you can stream movies and TV series for four hours using openload add-on and you will not get any pair error. After four hours, you need to pair your device IP with site IP again. This is one of the easiest methods of solving the Kodi pair error. There are other methods too which I am explaining below. You can use them in case if the above method does not work for you. This is also an easy and fast method. Just follow all the steps carefully and you won’t get any Kodi pair error. At first, launch Kodi and open the settings of it. Now, open system settings and change the export method. Next, select dependancy on after choosing addon header. Here, select URL resolver and click on configure option. On the next screen, you will get a list of provider based on the previously streamed providers on your device. Just click on the provider which is openload in this case, and disable it. Now, you can use the openload add-on for streaming free videos and movies after restarting the kodi. This was our step by step guide to fix Kodi pair error. I hope that you have fixed the Kodi pair error by now. In case, if you have not and facing any issue regarding Kodi pair error then feel free to ask in the comment section. I will try to solve your issue as soon as possible.